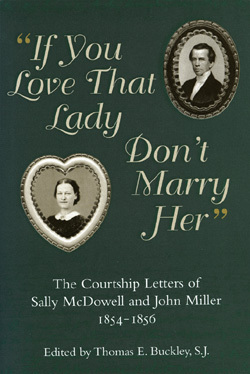 "If You Love That Lady Don't Marry Her": The Courtship Letters of Sally McDowell and John Miller, 1854–1856. Thomas E. Buckley, J.S., ed. Columbia: University of Missouri Press, 2000. Bound volume. Library of Virginia. Daughter of Governor James McDowell and related by blood and marriage to many of Virginia's most distinguished families, Sally McDowell (1821–1895) married Francis Thomas, the governor of Maryland, in 1841. His violent jealous rages made her fear for her life, drove her out of the governor's mansion in Annapolis, and eventually led her father to procure a bill of divorce from the Virginia General Assembly. The legislature allowed her to resume her maiden name but as Mrs. McDowell. In spite of her membership in, and close ties with, Virginia's social and political leaders, McDowell felt stigmatized and feared social ostracism if she contemplated remarriage. In the mid-1850s when John Miller, a Presbyterian minister and widower from Philadelphia, fell in love with her and proposed marriage, she resisted for many months, citing social conventions and pressures and her fears that his marriage to a divorced woman would injure his career. So strong was social disapproval of divorce that even though McDowell had been at no fault at all, members of her family bitterly opposed her marrying a second time, and members of Miller's church deprived him of his pulpit. McDowell and Miller married in 1856 and had two daughters and one son. After the Civil War, they moved to New Jersey, where John wrote about theology and Sally completed a biography of her father, one of the few book-length biographies of a politician that a Virginia woman wrote and published during the nineteenth century. For more than two years McDowell and Miller pursued their courtship by letter, producing one of the most remarkable exchanges of correspondence between a man and a woman in all of nineteenth-century American letters. They discussed love and family life, literature and theology, politics and society, slavery and social conventions. Their letters disclose their beliefs about love and families, their ideals about marriage and respectability, and the very deep pain that McDowell felt as a divorced woman in a society that valued social stability and family stability above nearly all else.